Economy Garages of Deerwood is known for our quality materials and construction expertise. This means you will enjoy the garage you envisioned at an affordable price and built to withstand whatever Mother Nature can dish out! 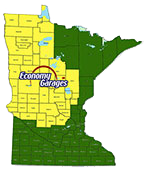 Click for enlarged view below to examine the precise building code and extras that make us the Minnesota leader in garage building.